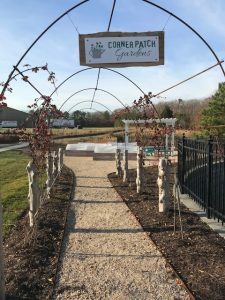 The Corner Patch Gardens are all set for the winter! 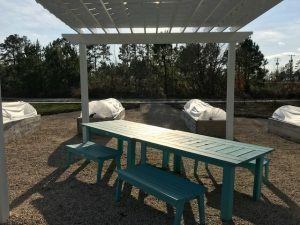 One of the best amenities at Cornerstone Homes is our new Corner Patch Gardens. 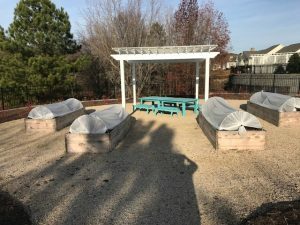 And thanks to our professional community gardener, Sean Sheppard, our gardens are all prepped for the winter. Sean has planted a variety of cold-weather crops, including kale, arugula, lettuce, swish chard, purple cabbage, mustard greens, carrots, beets and radishes. And the flowerbeds have been planted with cover crops. He has also sealed the beds up with a cloth-like material that transmits light and water but protects from frost and wind. With all his hard work, our gardens are set for the winter. And we can’t wait until Spring! In our region, gardens and farms are an ingrained part of the community. Our local family farms take great pride in providing us with fresh produce, eggs, milk and other healthy fare. It is our hope that our Corner Patch Gardens will be able to offer some of the same benefits to our residents, encouraging them to eat and live better.